We were living on Carmine Street in New York City’s West Village, just between Bleeker and Sixth Avenue, when our first baby was born. It was an incredible spot, a real diamond in the rough, that spilled out into a private courtyard surrounded by brownstone buildings, hidden from the filth and noise. We did not live in the brownstones, but our “nice sized one bedroom” (which was the size of my walk-in closet today) was the one lucky unit in our building that had access to this shared piece of paradise. For some I hear, New York City is an assault to their senses. But for me? For my husband? It is quite possibly the only place on earth where we are able to fully breathe. And so we dealt with the rats, and we put up with the roaches, because when you truly love something you do not think twice about the sacrifice. We gave up our bedroom and gave it to the baby. We got rid of our queen-sized bed and bought ourselves a pull out couch to save on space. My husband worked odd hours as a hotel doorman in Times Square; jumping on his bicycle during breaks to go on commercial and voice-over auditions, while I strolled the baby through Washington Square park. Our life in the city was not without its challenges, as we struggled to pay rent, and dragged loads of laundry three blocks to the laundromat. But we were New Yorkers through and through and we adored our sweet home and so we stretched out that apartment and life in the city as long as we possibly could. The hardest part of that tiny home on the corner of Bleeker and Sixth? Lifting the baby stroller over the homeless man that used my doorstep as his bed. Every afternoon I would come home to find him there, lying clear across the stoop, body pressed up against the gate. I imagine the first few times this happened I was frightened and uncomfortable by this unexpected visitor. It is unsettling to see the poorest of the poor up so close, in your face, literally blocking your way home. But over time I got used to it. The poor man no longer alarmed me, and I figured out a way to get around him. Joe’s Pizza was just next door, and so every afternoon one of the pizza workers would come on out when they saw me, and as I fiddled with the lock and opened the gate, they would help carry the baby carriage over the homeless man. In today’s Gospel (Luke 16:19-31), Jesus tells us the parable of the rich man who does nothing for Lazarus, the poor man who is literally lying at his door. And it has me thinking. Not only about that homeless man sleeping on my stoop on Carmine Street, but about all of those living in poverty who I encounter, outside of my home and under my roof, and how I respond to their quiet need. Do I respond to their need? In the parable, dogs licked the sores on Lazarus while the rich man dined in purple garments and fine linen. And I suppose if that rich man lived on Carmine Street, he too, would have had the baby carriage lifted over Lazarus, so that he could quickly get inside where he was comfortable, where he did not have to look at the poorest of the poor asleep at his door. And this is exactly the time of the Lenten season when God does this to me. And maybe to you too. He places a poor man on my doorstep. An unexpected soul in need. He forces me to stop in my tracks and pay attention and to look in the mirror and face my own poverty. And I have a choice here as to how I respond, don’t I? I can continue about my business, find my way around it, and grow used to it. Or, I can choose to be like the dogs in the parable, who comforted the poor man, who showed compassion by licking his sores. Now I will be honest. I have sat here for quite a while debating whether or not I should even say “licking his sores” because I don’t know about you, but that is a hard thing for me to imagine. Picturing open sores being licked clean by dogs is not a pretty image. But maybe Lent is not supposed to be pretty. And maybe we are being called to minister to those things that make us uncomfortable, that make us want to carry ourselves over and around it, that make us want to stay in our clean bubble dressed in linen, dining on fine things. Because the bottom line is that hard things are hard to look at and hard people are hard to minister to. But isn’t the hard precisely what we are called to look at? Isn’t the hard precisely what we are called to do? It is funny how we do this. How we plan out what we think we need to do for Lent, who we want to help, and how it fits into our everyday living, but how God has other plans to transform us. How we look to our forty day devotional that looks so cute on our nightstand, and our new pretty Lenten planners that photograph so well with a cup of coffee, thinking if we pour into these every day we will find what we are searching for. How we turn down that piece of chocolate or decide against that small purchase, patting ourselves on our backs thinking how good we are being. All the while, stepping over and around or taking the long route home, simply to avoid that one person who lies in our way; the one living in poverty who would settle for our scraps. But I want to be more than a scrap giver. And I want to be the kind of woman who is alarmed by the incredible and desperate need of those living in poverty around me. And I do not have to live in an apartment in New York City to encounter the poor. The poorest of the poor are everywhere. In our communities, our churches, our streets, our bible studies, our places of work, our exercise classes, our own homes. 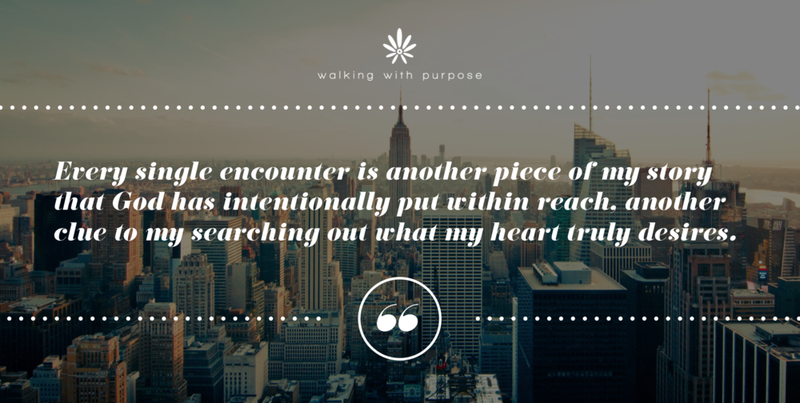 Every single encounter, from the woman in the pew behind me at daily Mass, to the stranger in the doctor’s office lobby, is another piece of my story that God has intentionally put within reach, another clue to my searching out what my heart truly desires. Sweet friends, are we not the ones who live in poverty when we choose to look the other way? Are we not the poorest of the poor when we are so busy dining we fail to invite the hungry to our table? We are not being asked to feed everyone living in poverty, or to save the world. That is not our job. But we are being asked to not step over that one person, that one inconvenience, that one thing that makes us uncomfortable to look at. God places these very things in our path. When we ignore them, we ignore Him. May we hold loosely to our own ways of seeking the Lord these next weeks, paying attention to the poor we have grown too used to. May we minister to every single soul we encounter this Lent, especially those we wish were not left on our doorstep, especially the ones we wish we could carry ourselves over. Let’s wake up to the dying in need and give more than our scraps. If the dogs can show compassion, surely we can too.